G. Philip (Phil) Robertson is University Distinguished Professor of Ecosystem Ecology in the Department of Plant, Soil and Microbial Sciences at Michigan State University. He is also a resident faculty at Michigan State University’s WK Kellogg Biological Station, where he has been based since the mid-1980’s. He is currently science director for the US Department of Energy’s Great Lakes Bioenergy Research Center, and from 1988-2016 he directed the U.S. National Science Foundation’s Long-Term Ecological Research (LTER) Program in Agricultural Ecology. His research interests include the biogeochemistry and ecology of field crop and bioenergy ecosystems, and in particular nitrogen and carbon dynamics, greenhouse gas fluxes, and the influence of climate change. He received his Ph.D. in Ecology and Evolutionary Biology in 1980 from Indiana University and his B.A. in 1976 from Hampshire College in Amherst, Massachusetts. 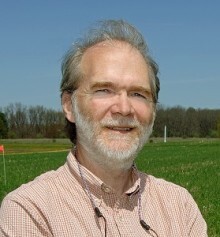 He is a Fellow of the American Association for the Advancement of Science and the Soil Science Society of America and has served on a number of national and international advisory boards and committees for National Science Foundation, US Department of Agriculture, Environmental Protection Agency, Department of Energy, and the National Research Council, among others.